I was researching on the day trips from Gdansk, the coastal city in the north of Poland. That’s when I got to know that I could explore Malbork Castle, which would not be just another castle. Yes, for starters, Malbork Castle is the largest castle in the world in terms of area. With Malbork Castle’s size being over 52 acres, it is also the largest brick structure in the world. I love castles but I had noticed the expensive prices for European Castles. And I was sceptic about Malbork Castle as well. So although these facts were enticing enough to take a day trip from Gdansk, I was hesitant. But I went ahead and managed to do it conveniently. And I must say, I enjoyed my trip to this mammoth castle. I planned this day trip on my own, and well within a budget. 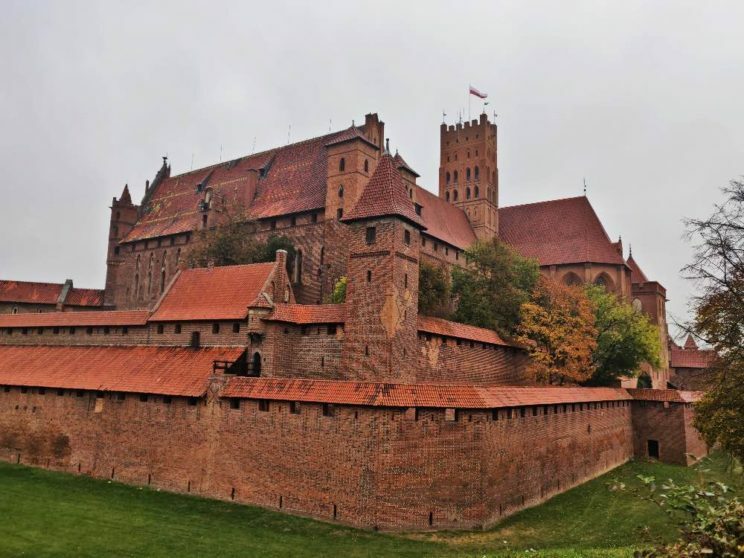 So in this post, I am going to share the details on how to plan a day trip to Malbork Castle without a tour. But before that let me first tell you about the Castle. 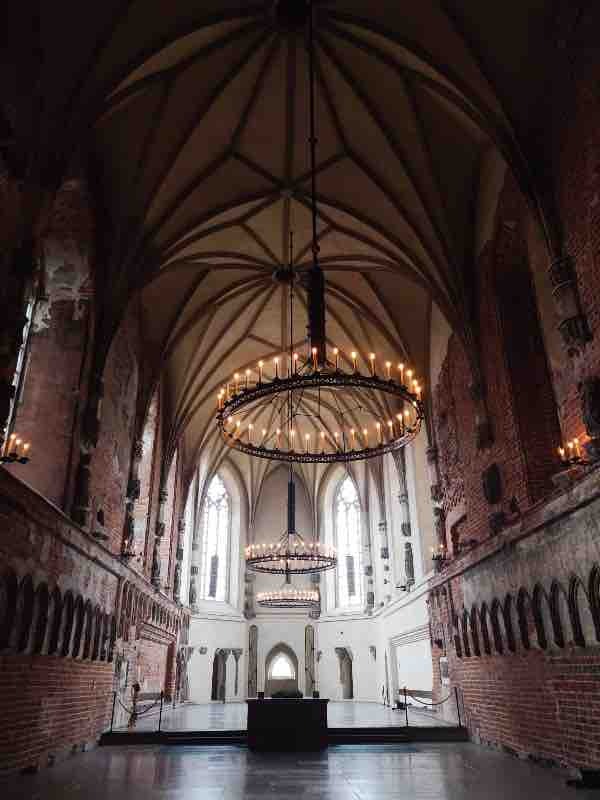 How to Get to Malbork Castle from Gdansk? 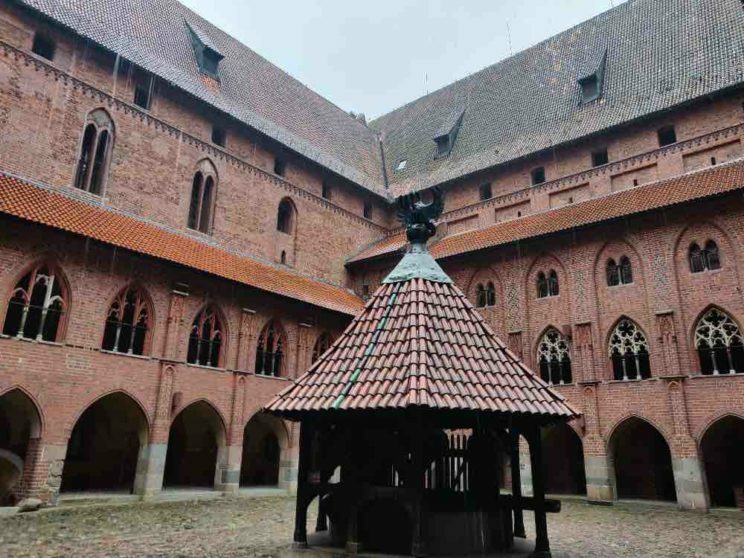 What is the best time to visit Malbork Castle? The full name of this castle is The Castle of the Teutonic Order in Malbork and was constructed in the 17th century in the town of Malbork in Poland. As the name suggests above, Malbork Castle was built by the Teutonic Knights, a German Roman Catholic religious order. The Castle initially served as a fortress as well as a monastery for the religious Teutonic Knights. Located on the banks of the river Nogat, it later became a place for traders shipping in the Baltic Sea. During the Nazi period, the castle served as a centre for its military groups. The majestic architecture inspired Hitler so much that his Third Reich’s castles’ architecture resembled Malbork Castle. At the end of WW II, most of the castle was destroyed by the Nazi army in 1945. Poland restored the glory of the castle by renovating in the later years. Malbork Castle was recognized as a UNESCO World Heritage site. 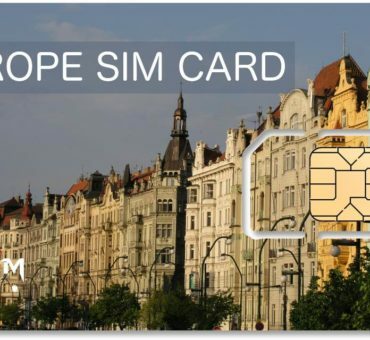 Gdansk is a great city with so many things to do. 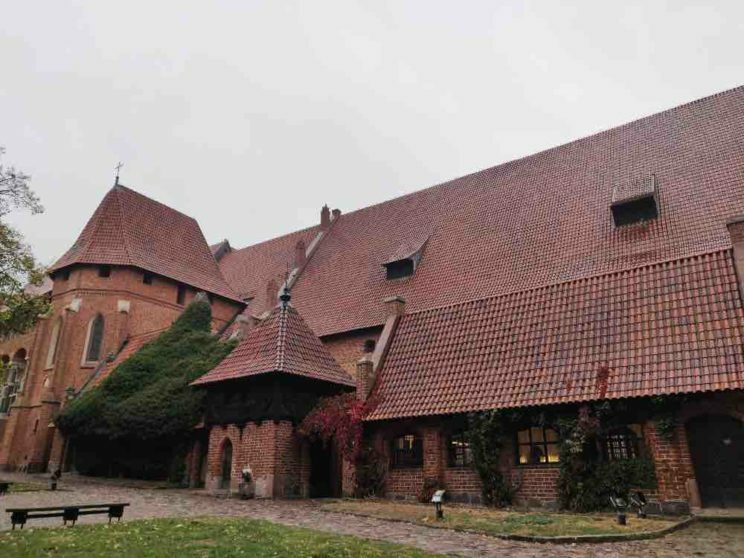 So assuming that you’d be basing there as I did, you would probably want to take a day trip to Malbork Castle from Gdansk. 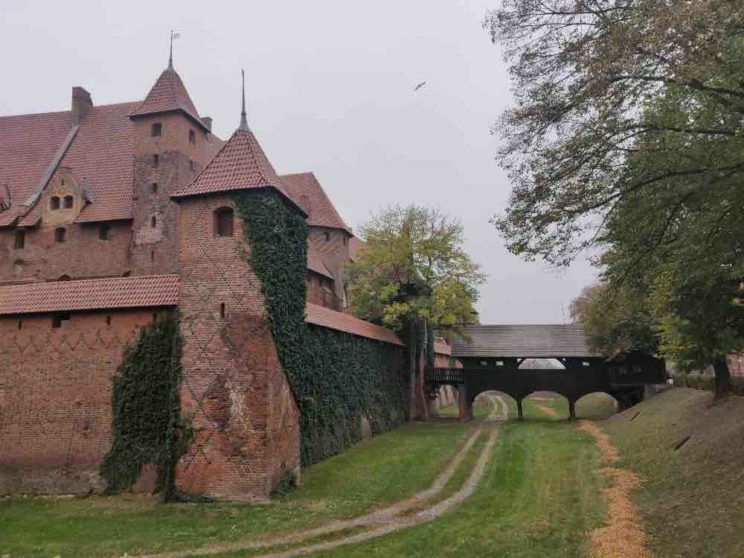 Here is how you can reach Malbork Castle from Gdansk – There is no option available to take you directly to the entrance of the castle, apart from taking a cab all the way from Gdansk or going on a private Malbork Castle tour, both being expensive options. The next best option is hopping on to one of the trains. I took the train from Gdansk to Malbork, and it is the cheapest option. There are 3 types of trains that you can choose from – the cheapest is the Regio train, for which I paid around 14 PLN. It took about 50 minutes to arrive at Malbork station. From the train station, the castle is about 2km. You can walk or take a cab from the station to the castle. 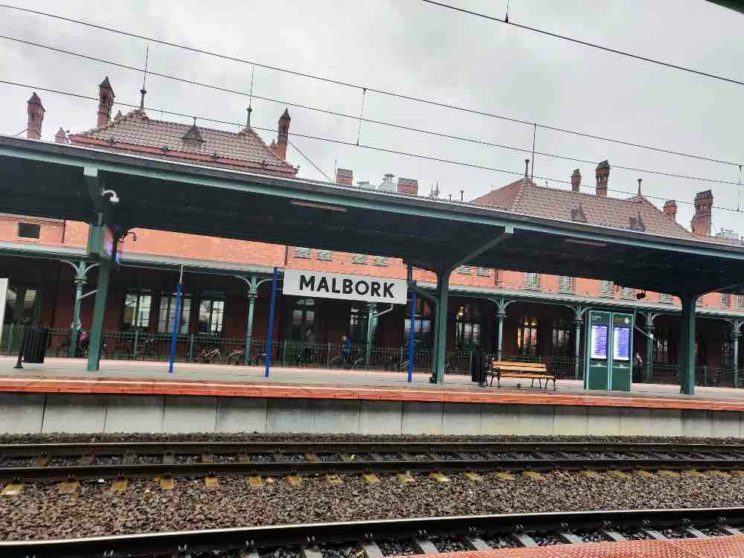 When you board the train, check if it stops at Malbork Kaldowo station, which is before Malbork. You can get a very good view of the castle from this train station itself. It’s about 15 minutes walk from here. You can see the full view of Malbork Castle from the riverside, allowing you to get some excellent shots. My train didn’t stop here, and I walked from the main station. TLK trains also stop at Malbork Castle. Slightly highly priced than Regio, it takes about 40 minutes. EIC trains directly go to Malbork, and it takes about 30 minutes. You can book the tickets online or get one at the counter. Check and buy the train ticket to Malbork here. Malbork Castle is not opened throughout the year, and the timings vary depending on the season. 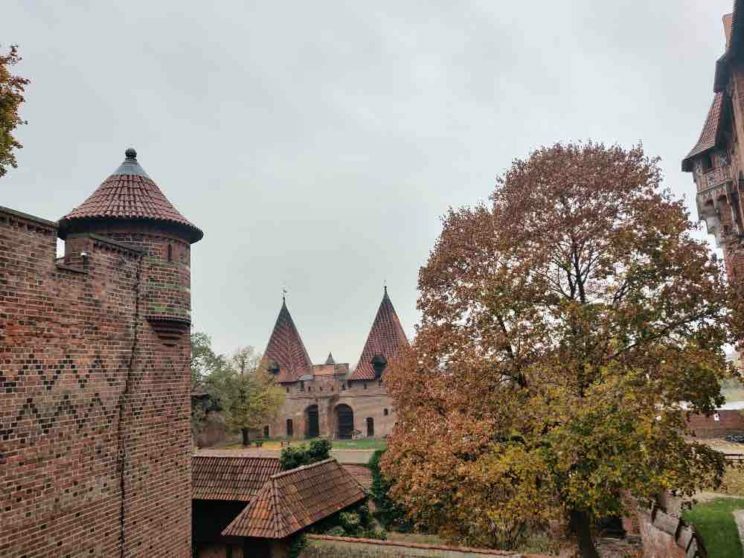 Whatever season you choose, it takes more than half a day to explore Malbork at ease. If you visit during the summer, you can also possibly go late in the evening as there are light and sound shows as well. Depending on the season, the timings and the entry fees are different. Here is the latest info on this. Timings: Interiors from 9 to 7 PM. Outside from 10 to 4 PM. Note that the discounted prices are different than the reduced price. Check this page to know if you can avail discounted prices. 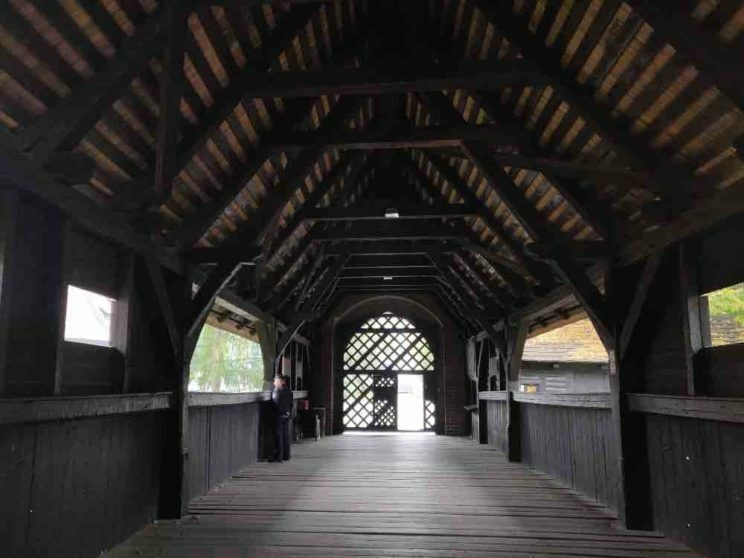 Every Monday, the entry to Malbork Castle is free. However, if you want the audioguide, you have to pay 8 PLN. The exhibition section is closed on Mondays. On Mondays, Malbork Castle timings are as below. You can buy the tickets to Malbork Castle on their website(link below). This option is best if you are traveling on weekends and during the high season. Otherwise, depending on when you arrive and on what day, you can pick up your tickets at the counter. Malbork Castle is divided into three levels. The first part is the lower castle, which is nothing but the entrance area including the bridge and the main gate. Passing through the gate, you’ll enter the middle section or Part B(as per the audio guide). I would prefer leaving the details as it’s fun to explore using the audio guide. Below are the things that you wouldn’t want to miss in the castle. In the middle section, you’ll pass through St. Bartholomew’s chapel, the Grand Palace, the ancient system of heating – It’s amazing to see a medieval heating mechanism that kept most of the rooms warm, the corridors, the spiral staircase, the glass paintings, kitchen and the cellar. The high castle section or Part C includes the beautiful courtyard, the Virgin Mary church, the chapter house and the archaeological exhibition among the other things. The train ticket is in Polish, just like everywhere in Poland. Plus, at Gdansk Glowny station, it might be hard to locate your train since the train name could be different and so could be the platform. There is no counter to check with someone and most boards have information in Polish. So please ensure to come early to locate your train and board it on time! 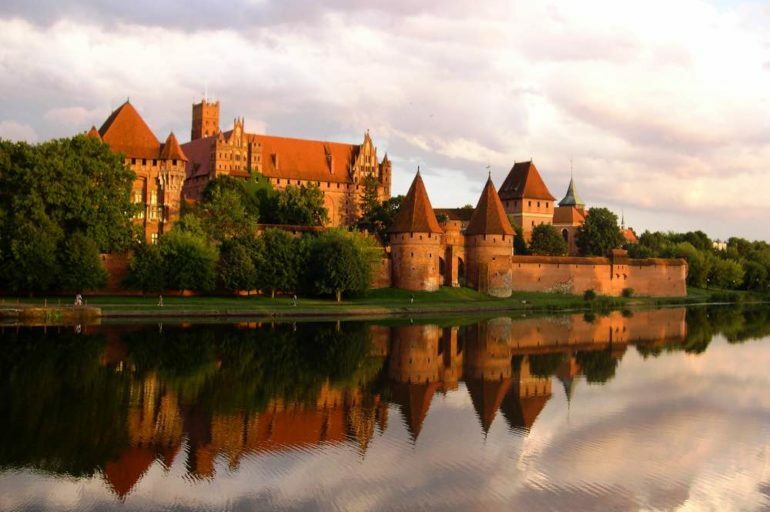 When to visit Malbork Castle? If you want to visit the castle without the crowds making the most of your time, the best way to plan your trip is to arrive early, just when the castle opens. In this way, you can be done by noon and take some time to explore Malbork. Alternatively, you can plan to be there a few hours before the closing time. If you want to choose a day when the entry is free like I did, try to be there before 2 PM. As it was the end of high season, some sections of the castle were closed. Also, the downside of visiting with a free entry during winter is that you get limited time to explore as the Castle closes early. But I guess since not all sections are open at this time, the time should be sufficient. Once you are in the high castle, you have an option of getting a splendid bird view of Malbork Castle from Wiezna Glowna tower. There is a separate ticket to get to the top, but I guess it’s worth it. This section was closed on the Monday that I went, so best to check prior. 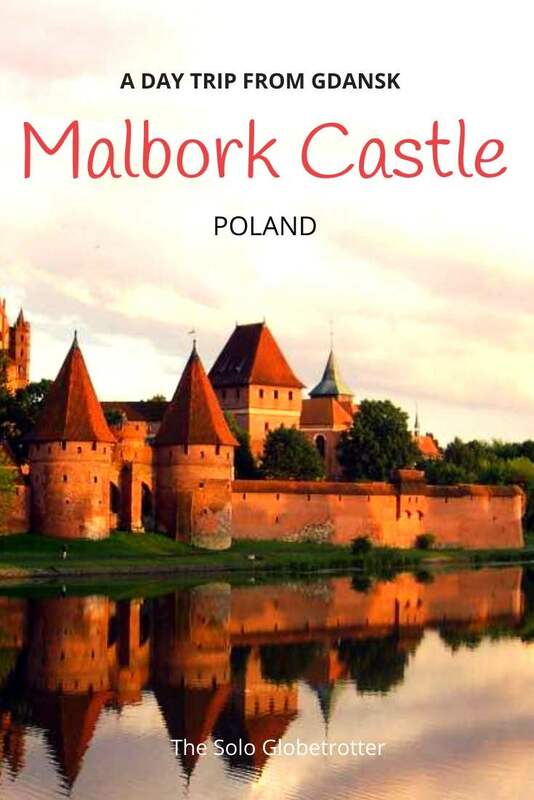 Is it worth buying the audio guide in Malbork Castle? I don’t buy audio guides usually but did buy one here. And I really enjoyed getting to know the castle’s history. Driven by GPS, it was total fun to use the guide itself, and I would say it’s worth the money spent. 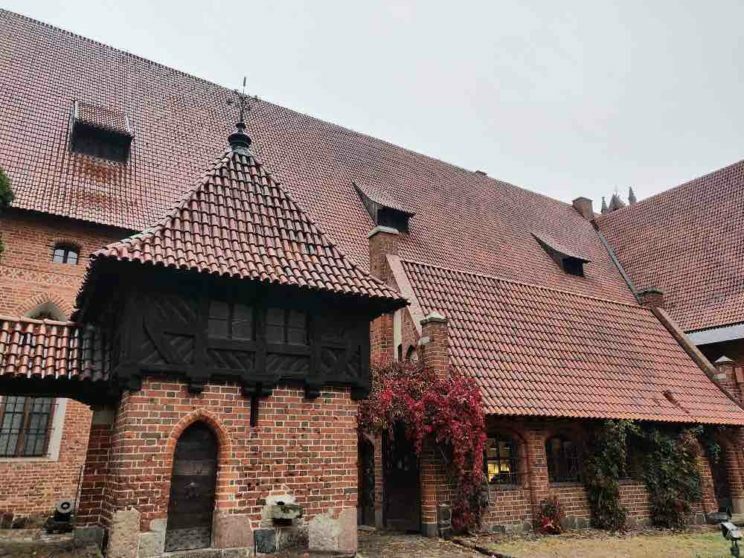 Where to eat in Malbork Castle? Just within the middle castle section premises, there is the Gothic Cafe. If you wouldn’t mind spending on delicious Polish cuisine offered in a Gothic ambience, you can reserve your table when you enter. However, apart from some snacks, there is nothing to eat just outside the castle premises. On the way leading to Malbork castle, there are some restaurant options, so you might want to plan accordingly. Big bags aren’t allowed inside. So avoid carrying anything extra. Finally, before visiting Malbork Castle, check their website here to find the timings and open times. Also, if you want to watch a Malbork Castle sound and light show, you can go to this page for details on the same. So that’s how you can plan a trip to Malbork Castle from Gdansk on your own. After reading this, if you still feel doubtful or find it exhausting, there are some tours that you can take from any of the ones below. I just want to include these although I haven’t tried because these have great reviews and are recommended by people often. Also, of course, they come with additional comforts of going on a tour relaxed, without having to worry about logistics. 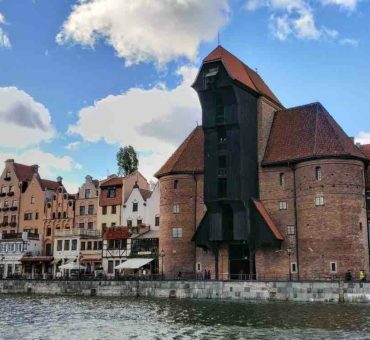 If you are looking for a comprehensive travel guide to Gdansk, check this huge guide, which consists of all the things to do in Gdansk along with some great tips!